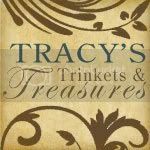 Tracy's Trinkets and Treasures: What Can You Do With a Clay Pot? What Can You Do With a Clay Pot? Or is it what can’t you do? I am participating in Donna at Funky Junk Interiors 2000 follower’s party. We get to play at the party. She asked us to come up with ideas using one or more clay pots. I don’t know if it’s because I want to be the teacher’s (Donna’s) pet, I am overly ambitious or because I was worried my projects just weren’t that good and I could distract you if I had photos of more than one. Here they are. 1. You can make a bird bath. My bird bath broke last year. It was one of the first birthday presents my husband ever bought for me about 14 yrs ago. I have been hinting for another one. For now I made a replacement. I started stacking my pots and sealing them together with Kwik Seal. I had to stop every other pot and get my hands clean. That stuff is messy. I added more sealant and rubbed it off with my finger tip after I placed the pots together. I wanted the pots to look like concrete so I painted them with the gray spray primer and then I gave them a white wash with watered down white acrylic paint. I may use the clear coat later. I really wanted to use the clay saucer that I bought but the size just seemed out of proportion. I found a plastic one in my garage. It had a little more depth to it. I haven’t glued either one to the stand yet. I may search for a different clay saucer first. Anyway, I have photos of each one. Here is the smaller saucer. 2. You can decorate a pot with paint. I have had this clay pot for years. I painted it red and added leopard print to the top. I have a thing for grape vine especially in the shape of a ball if you haven’t already noticed. This sits on my patio table. I think the speckles are dirt and debris. It lives outside and I don’t dust it! 3. You can make a candle holder. I just spray painted the pot with some Oil Rubbed Bronze and rubbed a decal on a hurricane glass that I already had. I stuck a candle in it and there ya go. It’s got to be a great day when…. Weekend finds. Like I need one more chair.